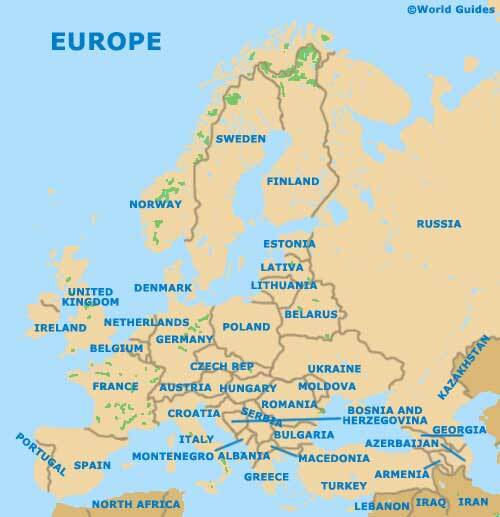 Lying on the northern side of the Mediterranean, the continent of Europe is bounded by the Atlantic Ocean on its western border and by both the Norwegian Sea and Barents Sea on its northerly axis. Many of the world's most visited and influential countries reside within Europe, grouped as the Baltic states, Benelux, Britain and Ireland, Caucasus, Central Europe, France, Iberia, Italy and Scandinavia, as well as Cyprus, Greece and Turkey, and Belarus, Russia and Ukraine. Europe covers an area of approximately 10.4 million square km / 4 million square miles and enjoys annual visitor numbers in the region of 500 million. Many European countries are famed for their rich cultural heritage, spectacular man-made sights and reliable modern transport. Choose between the canals and waterways of Amsterdam, the Eiffel Tower in Paris, the Colosseum in Rome, the Greek temples of Ephesus and Athens, London's Buckingham Palace and St. Paul's Cathedral, and the Plaza Mayor in Madrid. Many countries now below to the European Union, which was set up in 1992 in a successful attempt to establish a level market using just a single currency - the Euro (EUR). Currently some 28 countries are members of the European Union, reducing the need for currency exchange as you travel across their borders. The republic of Austria lies in the very heart of Europe and is bounded by the Czech Republic, Germany, Hungary, Italy, Slovakia and Slovenia. Home of the waltz and the apple strudel, Austria is rich in culture and tradition. Belgium resides in the north-western part of Europe and is particularly close to France, Germany, Luxembourg and the Netherlands. Although this is amongst Europe's smallest countries, Belgium is filled with interesting cities and towns, which are often based around the Schedlt River. Located in the English Channel, between southern England and north-western France, the Channel Islands comprise Jersey, Guernsey, Sark, Herm and Alderney, along with a series of small islets and rocky outcrops. The Republic of Croatia is a Central European country, situated beneath both Hungary and Slovenia, and alongside the countries of Bosnia and Herzegovina, Montenegro and Serbia. Bounded by the Adriatic Sea, Croatia contains a number of appealing beaches, holiday resorts and islands. A sizable Euroasian island country located in the easterly Mediterranean region, the Republic of Cyprus is famed for being the place where a number of Greek gods where born, including both Adonis and Aphrodite. A landlocked country within the heart of central Europe, the Czech Republic is bordered by Austria, Germany, Poland and Slovakia. When the Cold War finally ended in the early part of the 1990s, much of the country began to enjoy increased levels of tourism. A Scandinavian country located in the Nordic region, Denmark is especially close to both Germany and eastern Sweden. Denmark boasts a strong Viking heritage and this fact is celebrated at various museums around the country. England, the largest country in the UK, is steeped in history, with many landmarks famous all over the world. Highlights include Stonehenge, London's Houses of Parliament, Oxford University, the Roman city of Bath and countless seaside resorts. A small and appealing country offering an array of seasonal activities and attractions, Estonia is at its most appealing during the warm and inviting summer months. However, huge numbers of skiers do arrive each winter. Finland is and extremely modern country, with many stylish cities and towns. However, despite Finland's successful attempt to embrace the 21st century, the country has managed to retain much of its Scandinavian heritage. The Republic of France is sited in Western Europe, next to the English Channel, the Atlantic Ocean and the Mediterranean Sea. The Federal Republic of Germany is known for its past communism and its fairly recent reunification of East and West Germany regions. Greece is a country standing in south-eastern Europe, between the Mediterranean and Aegean Seas. Popular Greek islands include Corfu, Crete, Rhodes and the Dodecanese Islands. Standing within central Europe and completely landlocked, the country of Hungary offers an extremely green and verdant landscape, with large expanses of farmland and countryside. A milder country than many visitors are led to expect, Iceland is famed for its diverse natural attractions, which come in the form of steaming geysers, hot springs and even some volcanoes, a number of which remain active. Ireland consists of two separate countries - Northern Ireland and the Republic of Ireland. Northern Ireland is part of the UK and home to the city of Belfast, with counties of Antrim, Armagh, Down, Fermanagh, Londonderry, and Tyrone. The country of Italy is situated in Southern Europe and is shaped as a long peninsula, surrounded by the Tyrrhenian Sea, the Ionian Sea and the Adriatic Sea. Islands in Italy include Sardinia and Sicily. A small country bordered by France and the Mediterranean Sea, the Principality of Monaco sits on the French Riviera. The country of the Netherlands lies in Western Europe, next to the North Sea. Much of the country is fairly flat and low, with some areas actually being below sea level, including the famous Dutch dykes. 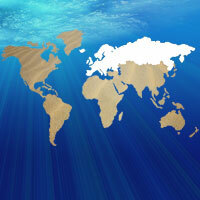 The northerly Kingdom of Norway is to be found next to both the Norwegian Sea and also the Arctic Sea. Norway features an extremely long coastline, around which many popular beach resorts are gathered. Summer is a good time to visit Norway, when the sun never actually sets and exciting night-time celebrations take place. Although Poland may be known for its communist past, the country of today has gained its independence and has never been more appealing to visitors. The Portuguese Republic is situated on the south-western side of Europe and is known for its sunny weather and numerous beach resorts. A number of islands are considered to be a part of Portugal and include both the Azores and Madeira, two major tourist destinations. A vast city with a strong Soviet past, the Russian Federation is the largest country in existence and is simply vast, encompassing many different landscapes, time zones and some quite distinctive climatic extremes. Scotland stands to the north of England and is actually the northernmost country in the UK. With a rich Scottish history and a wealth of places to visit, Glasgow and Edinburgh are Scotland's largest cities. Considered to be the most important of all the Nordic countries, Sweden sits within the northerly region of Europe and alongside both Denmark and Norway. Sweden is the birthplace of some many iconic brands and names that are known the world over, such as Ikea and Volvo, whilst also being the official home of the Nobel Peace Prize. Switzerland is famed for is recreational activities, which are often dependent upon the season and include everything from hiking to mountain skiing on the Swiss Alps. Home to the United Nations headquarters, Switzerland's biggest cities are extremely important in the world of finance. The Republic of Turkey stands between both western Asia and south-eastern Europe, and is bounded to the south by the Mediterranean Sea, where a number of popular Turkish seaside resorts are to be found. Wales is located to the west of England, bordered by the Irish Sea and the Bristol Channel. Much of the Welsh scenery consists of green hills and high mountains, including the Brecon Beacons, Mount Snowdon, the Cambrian Mountains and Snowdonia.